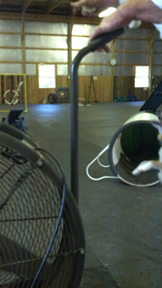 A very basic exercise I do with a young dog is the “exploding” line of jumps. The objective is to teach the dog a “Go On” directional. And for the young dog the exercise establishes an understanding of the game in which he has permission to work at a distance. This begs the question, how do you teach the “Go On” directive to a dog that is not young (say a dog that is two years old, or older)? 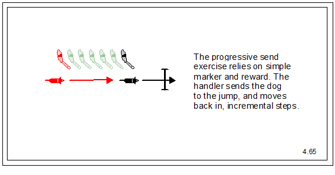 We’ll back up a step to look at another related exercise, the progressive send. This is a simple dog training exercise. The handler begins close to the jump sending the dog, and moves back a few inches at a time. It’s very basic stuff, limited only by the size of your back yard. 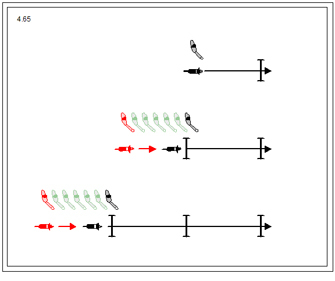 What I would like to do is blend the progressive send with the exploding line of jumps. Now the send is back-chained. The handler continues to gradually move back down the line, insinuating a new hurdle when he’s gained maybe 14′. When the line of jumps has reached four or five… then they can be exploded a few inches extra at a time. I had an interesting conversation with a student in a private lesson. She told me that she wanted to enter her dog(s) into the distance program at her training center, but was not allowed because her dog had not attended/graduated from a series of “foundation” classes. The horrible thought lept into my mind that the “foundation” class is where the dog’s prospects for working at a distance from the handler are utterly destroyed. 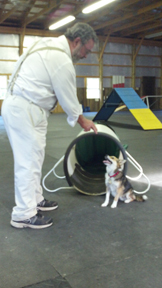 The dog learns to run agility tied to the handler’s hip. The opportunity to learn to work at a distance from the handler as a part of his “foundation” is completely lost. Distance becomes a matter of painful remediation. Consequently I ignored every opportunity to focus on “handling” and devoted our time together exclusively to distance training topics. I want to share a couple bits with you, mostly in order for me to document a thing or two that I might have learned. So here’s the deal. The foundation book is not a mixed-bag potpourri of options and occasionals. All of the exercises are intended as a homogenous whole and all must be approached with grueling consistency and continuity until the esential skills are owned by the dog. Easy for me to say, I’m sure. 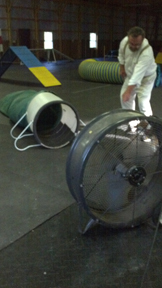 This is a simple exercise you might do with all obstacles. 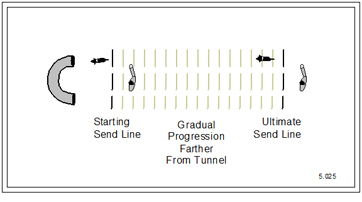 The handler begins close to the obstacle, sends the dog forward for the performance, and over time moves back farther and farther until the dog is being sent from a magnificent distance to the performance. Certainly, early on the tunnel is a fun exercise to practice progressives sending. 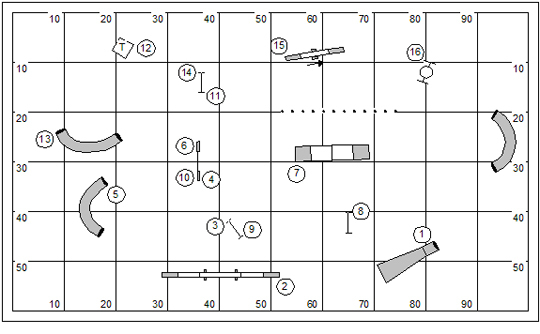 This exercise depends on a strong send to the pipe tunnel at #3 so that the handler can appear at the corner of the turn at jump #5 at precisely the moment the dog arrives at that jump. 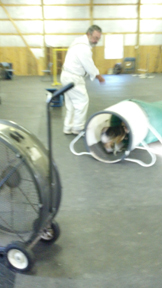 The faster the dog is, the more important it is for the dog to have the sending skill to the tunnel. 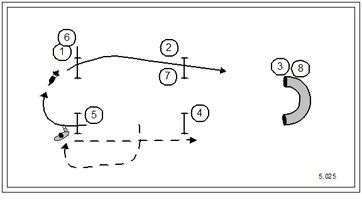 In the progression of the exercise I’ll typically associate a displaceable “wing” at the corner jump (#5) to get the dog off the handler’s hip. 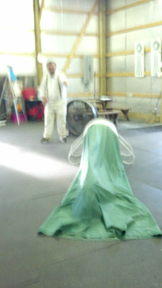 This is especially difficult for handlers who train where there are no winged jumps. The idea of the dog being 5′ away can make their heads explode. In the next bit I’ll take the wing away. But I’ll ask the handler to visualize the wing and to conduct the turn from this modest lateral distance. I have to remind the handler that the dog turns “when” the handler turns, not “where” the handler turns. The next step is quite an advancement; but a logical one. The handler will “layer” the tandem. 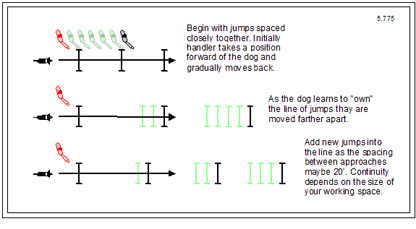 The handler shows the turn at the corner but doesn’t cross around behind the jump at the corner. 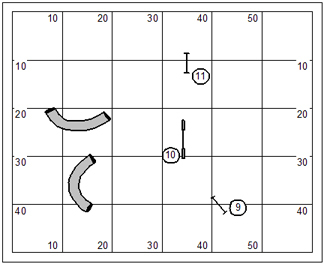 Instead he will move in a path parallel to the dog, which should neatly drive the dog to the pipe tunnel at #8. 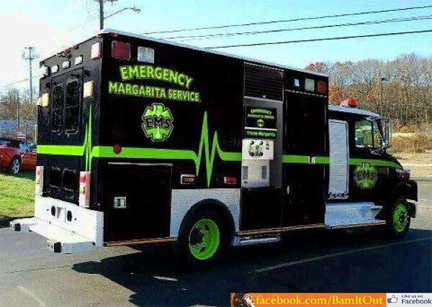 I hope this is covered by the Affordable Health Care Act! You know, I’m judging a USDAA trial at the end of the month. For this trial I had to design 38 courses to be run over three days. 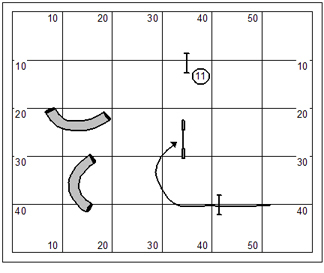 This is a fantastic and traumatic feat for the course designer. Naturally I’m keen to share some of the courses with you; but that would be inappropriate should anybody down in North Carolina be paying attention. Courses can be shared only after the fact. This will be a two-ring one-judge trial. For the exhibitor it makes for a relaxed kind of day. There are never conflicts; and everyone can watch every run should they be so inclined. For the judge, on the other hand, it is a grueling nonstop weekend running from ring to ring trying to set the best pace with negligible downtime for running dogs. The cool thing about a two ring trial is that I don’t have to be quite so ardent in my nesting as I would be working in a single ring. While I don’t want to work the course builders to death with complete rebuilds (which they can do while I’m judging dogs in the alternate rings); I do have considerable flexibility in making course changes that would be a drag on time in the single ring. While I was designing courses for this trial I found myself attenuated to flow and the appropriateness of challenge. Really, if you think about it, the individual competitor deserves every time he walks into the ring something that will be fun; something that offers a realistic opportunity to qualify. It’s too easy when you’re designing 38 courses to go brain-dead, hurried and indifferent. This is true especially when nesting Starters and Advanced courses to the Masters course. It’s easy to insinuate the ugly residue of Masters in the Advanced course just for being a bit lazy. Anyhow, for the weekend I probably came up with only two new and interesting (to me) new course concepts. I also dredged a couple of old favorites (the crafty exhibitor would have to dig very hard and be very lucky to find them). Once you have the central course concept, nesting spawns out in all directions… to the lower level classes, and to the games. I’ll be sure to share courses after the end of the month. For work with my own dog (and a series of private lessons this weekend) I went out and borrowed something I saw on somebody else’s blog. It was titled “Lidocaine” or something like that. Don’t ask me, I don’t know; I think the gist of the blog post was to suggest that religion and politics on Facebook gives you a rash. The author’s original course had the weave poles at #2. I’m working a dog with contact issues and needed the dogwalk to be there. Later I came back and stuck the weave poles into that bit of dead space between the A-frame and teeter, for alternate sequencing. I like running my dogs on courses designed by other people. They’ll do things that wouldn’t occur to me to do. And that is the nature of the real world; prepare for the unexpected. The hard aback turn on the dismount of the dogwalk can be a tricky bit particularly if the handler has to run to the dismount to sit on the dog’s head before turning back to jump #3. With a Front Cross there’s some potential for reversing the dog’s direction and putting him right back on the dogwalk for a wrong course. What I would like to do with my own dog, after making a presentation of the dogwalk, is to move on an oblique path to the outside corner of the #3 jump. After my dog assumes the unambiguous position it should be an easy matter to show him a nice straight line through jump #3. That also leaves me in position to pre-cue the turn and manage the interesting handling bit after the jump. Another interesting bit is the “serpentine” from jump #9 to jump #11. 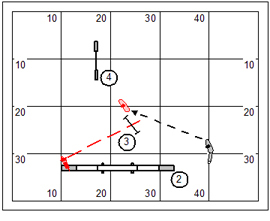 The transition from jump #9 to #10 is a blind/managed approach. Do you see that? 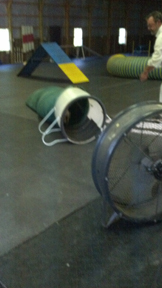 And this is offered with two tunnels crowding the landing side and calling to the dog. I ask if you see it. The rotation of jump #9 presents a common illusion that obscures the blind approach, because of the rotation of the jump. The dismount is dictated by the approach and not by the rotation of the jump. Here I’ve rotated the jump square so that the illusion is evaporated and you can more clearly see the challenge of the blind approach. Okay, there’s some other interesting stuff about this course I’ve stolen. It will have to wait. It’s late and I’m about to turn into a pumpkin. 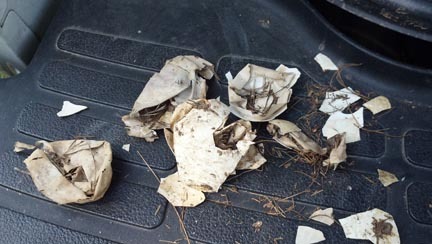 You are currently browsing the Bud Houston's Blog blog archives for August, 2012.